At a time when Russia is nearly suing Ukraine — thus eroding Tymoshenko’s reassurance that neither side would sue the other — Tymoshenko decides to borrow some money from Russia. Instead of heeding the call to balance the budget, voiced by President Yushchenko and Finance Minister Pynzenyk, she takes her business elsewhere. On Thursday, she sent a delegation to Moscow angling for a loan of $5B at an interest rate of LIBOR +8 to +9% for a period of 5 to 7 years, Dzerkalo Tyzhnia reports. 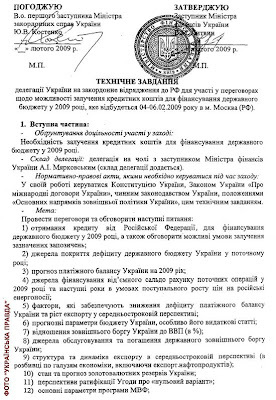 Ukrayinska Pravda obtained a copy of the delegation's directives. In Ukraine, the buck never stops. In Russia, they made big bucks during the oil boom. Like the IMF, they know what they want, and their interests never stop with the interest rate. Is that too much to ask? Tymoshenko doesn’t think so. So there she is, beating a path to Putin’s door, trading favors, and doing whatever it takes to get the presidency — whatever the cost. It must have been the missing link in her Ukrainian Breakthrough program. Tymoshenko has admitted to getting Russia's approval for the loan, but has denied accepting the conditions listed above. "It's not true," she said, despite the “zero option” being clearly stated as No. 11 in the directives. Should Russia loan money to Ukraine, - after all of those (critical) posts about Russia in the blog "Ukrainiana"? If you were Russia, what would you do? Unfortunately, I’m being totally outmaneuvered by Russia's generosity, coupled with Tymoshenko's gas skills and financial genius. I voted “yes” because Tymoshenko’s stewardship of the economy makes the default scenario appear more likely. Instead of balancing the budget, she wants to joggle with more debt. She does business with Putin. She wants to be president. But who will pay for Putin’s investment? Who will pay for Tymoshenko’s presidency? Unless Russia wants to buy herself a Ukrainian president, the money would be better spent elsewhere. But I think that’s exactly what Russia wants. Here's what I am trying to figure out. Tymoshenko and the Ukrainian government just spent BIG BUCKS on the Blackstone Group to "advise" them in their dealings with the IMF (International Monetary Fund). The IMF told Ukraine to balance the budget and restructure the banking system. Ukraine agreed to balance the budget - but it wasn't done. The banking system? Nada, null, zilch. Why the hell do they need the Blackstone Group, if Tymoshenko and Parliament are simply going to ignore the IMF? This is a serious, serious blunder on Tymoshenko's part. It's bad enough to go to the Mafia thugs in roosha for a loan, with every prospect that those thugs will want not only your firstborn children, but also you dogs, your possessions, and you soul. But it's even worse to lie about it. The IMF came to Ukraine last week to see about lending Ukraine some more money out of the $16 billion commitment. If Tymoshenko and her fellow idiots in Ukrainian government don't understand it, maybe the Blackstone Group can explain it to them. Why the hell did they hire the Blackstone Group??? "England doesn't have permanent enemies or friends, permanent only her interests"
- same can be said about the Ukrainian Prime Minister. The Russians are trying to buy a Ukrainian President? Didn't the Americans do the same? Oh, yes, they got the President for free didn't even pay anything Ukraine. As for Timoshenko trying to borrow her way out of his mess, doesn't everyone? The USA are doing the same - printing and borrowing more money to "solve" (i.e., postpone the inevitable) the problems. I hope Ukraine won't default. You've done a lot of background checks! For Yushchenko to qualify as a U.S. puppet, he should put us into NATO first. Under a Tymoshenko presidency, that would be impossible, which explains Putin's generosity. You and I agree that borrowing alone will not stop the bleeding in the long run, right? With that in mind, I want the governments of Ukraine and Russia to be more accountable to their people instead of being eager to buy or sell presidencies. Obama No Longer Supports NATO Track for Ukraine? Kosmos: "Everything I Touched Turned to Gold"